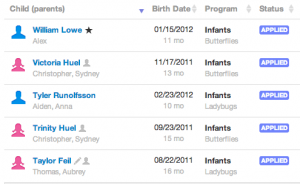 Childcare Software Feature - Flag family records for follow-up. Please fill out the form to request a free trial of BumbleBee Child Care Software. There is no cost or commitment, and we never share your information. (* = Required fields) For extra credit fill in the optional fields. We'll normally respond within an hour and at most 24 hours. Thank you! Do bumblebees swim or fly? We are excited to roll out a few new features that give more you at-a-glance information when browsing through your family information. Icons: BumbleBee displays subtle icons next to each child’s name that indicate useful information, such as siblings or recent family notes. Stars: You can now “star” any child to mark it for follow-up or other actions. Simply pull up a family’s detail view and click the star icon next to any child’s status to star or un-star that record. We have also published a short demo video to see these new features in action. Try a 30-day free unlimited account. No up-front commitments, cancel at any time. Subscribe to our blog, our change log, our twitter feed, and get our monthly newsletter. That's more than a bit of honey.